The diagram shows the layout of a typical IPhone application. Each UI component name is also stated in the diagram. Usually an IPhone application has one UITabBarController. When the tab bar is selected, a specific NavigationController is activated. 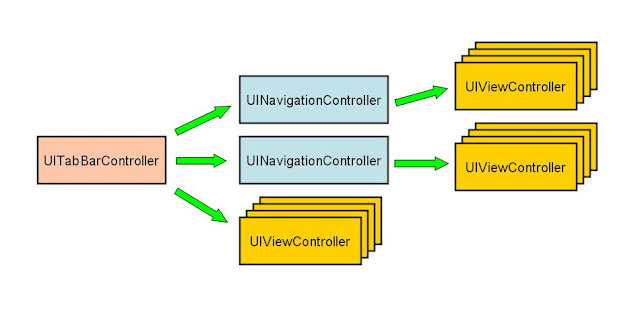 Each Navigation Controller can be pushed with one or more View Controller. Typically other View Controller can be invoked by linking a button to the method that pop the view controller. The above code is typically add to applicationDelegate viewDidFinishLaunchingWithOptions method. The TabBarItem image and title can be customized by changing the tabBarItem field in navigationController or viewController. Eg: The customization code can be added to the viewDidLoad method of the viewController.